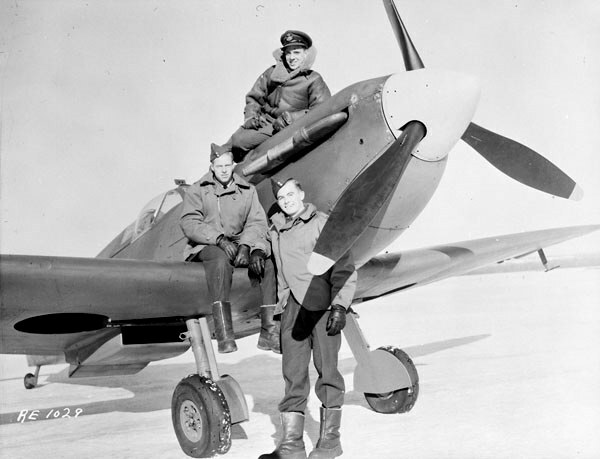 Unidentified personnel with Supermarine Spitfire serial no. R7143 of No.13(P) Squadron RCAF, Rockcliffe, Ontario, Canada, 14 January 1944. Identifying the mark of this Spitfire solely on the basis of this photograph is elusive. R7143 was built at Eastleigh as Mk. I and made its maiden flight 5 on February 20, 1941. It was subsequently converted to a PR Mk. I G in October 1942. Type G was intended for low altitude reconnaissance and as such it retained a full complement of eight .303 inch Brownings. Further history of this airframe is difficult to establish with certainty. Some sources state that in December 1942 this aircraft was converted to PR Mk. IV with Merlin 45-series engine and a completely new wing clean of armament. Others imply that although the armament has been removed, the aircraft did not receive a Mk. IV wing with extra tankage. It gets even more confusing as records also list R7143 as PR. Mk.VA and PR. Mk. VII before it was shipped to Canada on February 10, 1943. This is Spitfire X4555, former Battle of Britain veteran with No. 92 Squadron at Biggin Hill from October 28 to Nov 1, 1940. Transferred to the RCN Fleet Air Arm in 1947, this Spitfire was suppose to be delivered to the RCN Air Electrical School at HMS Stadacona but was in stored non-flying condition. Spitfire R7143 (all silver finish) was flown to Halifax, via No. 5 Equp. Depot based at Moncton and then onto Halifax. The demise of X4555 remains a mystery.